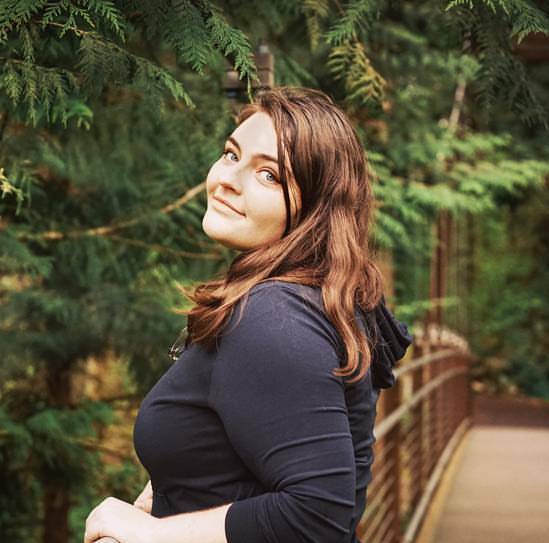 If you’ve ever seen the movie My Neighbor Totoro then you are probably familiar with these solemn and sweet creatures. Since they’re licensed characters, I’m offering this pattern for free FOR PERSONAL USE ONLY. Please do not sell these items or reproduce the pattern anywhere! 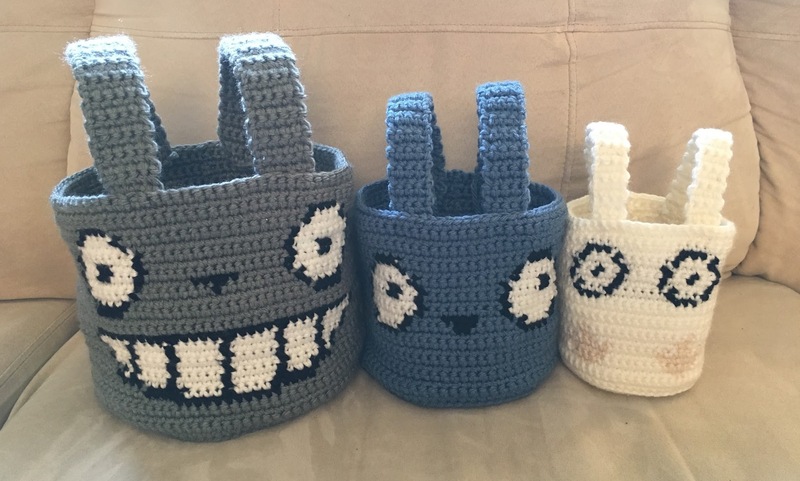 Below you’ll find the instructions and charts for these Totoro baskets. If you’re not familiar with intarsia, I’d recommend watching a few Youtube videos of this technique first. 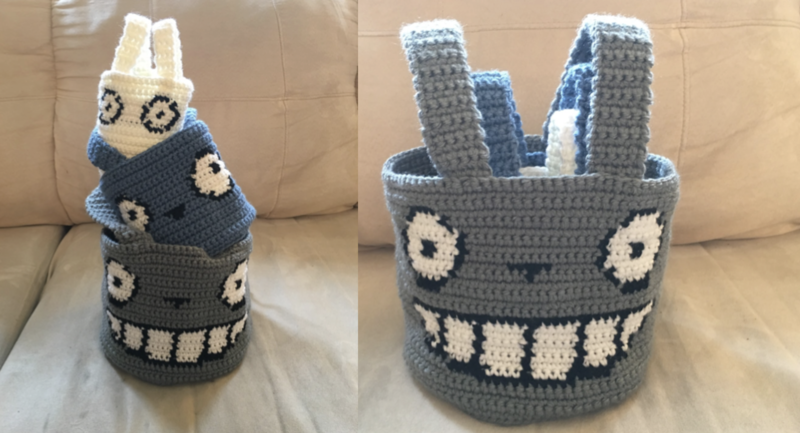 The colorwork section for each Totoro’s face uses intarsia, and this pattern is fairly basic and doesn’t include a tutorial for color changing. Now let’s get started! The base of the basket is worked in the round, without turning at the end of each row. From this point forward, the sides are worked in joined rows, so you will turn at the end of each row. R32: Sc in each st around (54) then sl st in 1st st. After that, fasten off and weave in the ends. Fasten off, and then sew the handles to the basket above the eyes. R36: Sc in each st around (66) then sl st in 1st st. After that, fasten off and weave in the ends. R43: Sc in each st around (90) then sl st in 1st st. After that, fasten off and weave in the ends. I hope you enjoyed this pattern! 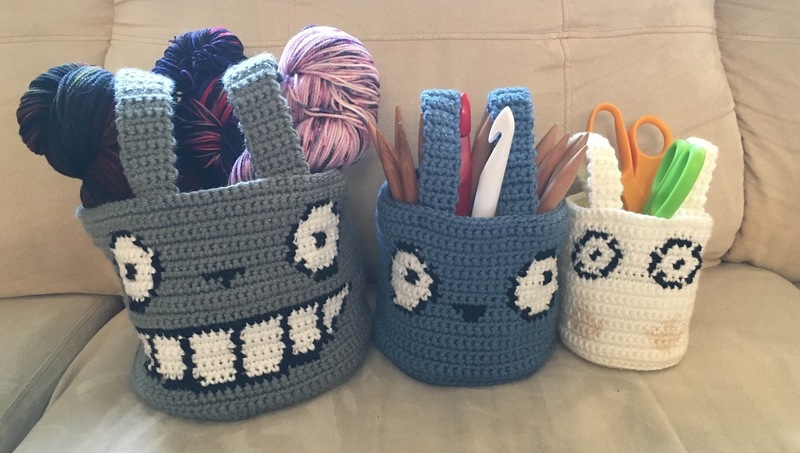 Don’t hesitate to fill these cute baskets up with all kinds of crafting goodies.